Will Seahawks Richard Sherman, Earl Thomas Injuries Be a Factor in Super Bowl XLIX? PHOENIX, AZ — Seattle Seahawks cornerback Richard Sherman (elbow) and safety Earl Thomas (shoulder) were both injured in their win over the Green Bay Packers on Sunday, Jan 18, but the question is will their injuries be an issue when they meet the New England Patriots in Super Bowl XLIX ? Source: NJ.com. Photo shows Richard Sherman speaking with Fox Sports about Tom Brady in 2013. Head coach Pete Carroll addressed the media last Sunday, where he gave an update on the status of probably his two best players on defense for this weekend’s matchup against the New England Patriots. According to Carroll, “Richard practiced in all the practices, and he looks to be fine. He still has an elbow to take care of, but he’s practiced well. Earl practiced yesterday, the day before and got the last day of practice in and looked fine.” Regarding his elbow Sherman said, “I’ve been able to move it a lot better than I did earlier.” He also told the press that he hopes that Tom Brady and the Patriots try to test his injured elbow. What do you think? Will their injuries be an issue in Super Bowl XLIX? 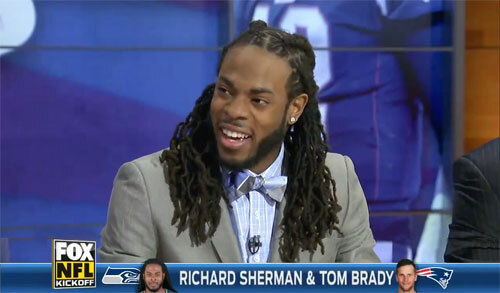 Watch Richard Sherman speaking with Fox Sports about Tom Brady in 2013.